Vom 19.-22. März 2015 bietet die American Quarter Horse Association, AQHA (Halle 7, Stand C32) auf EQUITANA in Essen wieder ihren exklusiven Vor-Ort Service an! Hier können direkt alle Formalitäten rund um das American Quarter Horse erledigt werden. Neben generellen Informationen, Auskünften oder Fragen rund um den größten Pferdezuchtverband der Welt sind Ihnen zwei Mitarbeiterinnen des AQHA Offices aus Amarillo, Texas, die Tom Persechino, Executive Director of Marketing and Communications begleiten, bei Anträgen wie Mitgliedschaften, Umtragungen, Stallion Breeding Reports über Leasing-Verträge etc. bis hin zum Certificate of Registration (CoR) Direkt-Ausdruck behilflich. Die mehrsprachige Standbesetzung rundet den Service ab. Besuchen Sie die AQHA in Halle 7, am Stand C32. From March 19th hall 7, booth C32 their exclusive on-site service at the EQUITANA in Essen. All formalities surrounding the American Quarter Horse can be done here directly. 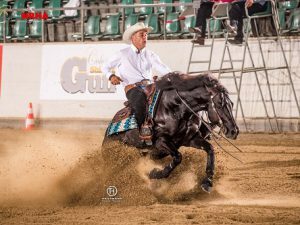 Two AQHA employees as well as Tom Persechino, AQHA Executive Director of Marketing and Communications, will answer all questions about the world’s biggest breeding association and the American Quarter Horses. Furthermore they will help with membership applications, transfer reports, stallion breeding reports, leasing contracts and certificate of registrations. The multilingual exhibition crew completes the service. Visit the AQHA in hall 7, booth C32.